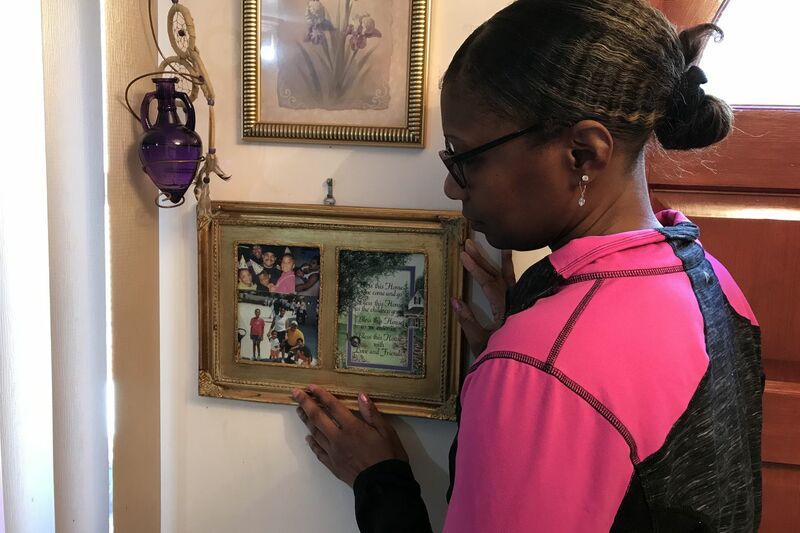 Kristi Richardson looks at photos of her husband, Michael Richardson, at her home on Friday, March 15, 2019. The wife of a slain Rite Aid store manager whose killer had his death sentence lifted last week in favor of life in prison without parole is saying she was misled by the Philadelphia District Attorney’s Office when it willfully abandoned seeking the death penalty during a resentencing hearing last week. Kristi Richardson said she told prosecutors she wanted Christopher Kennedy to remain on death row for the slaying of her husband, Michael, during a 2003 robbery. Kennedy had won a new sentencing hearing on appeal. Philly DA Larry Krasner stopped seeking bail for low-level crimes. Here’s what happened next. “I was just led to believe there was no option,” Richardson, 47, said Friday in the dining room of her Philadelphia home, where she keeps framed photographs of her husband with his then-young kids hanging on the walls. Assistant District Attorney Paul George, assistant supervisor of the office’s law division, led her to believe that the death penalty was not an option, she said. “He was really nice to me,” she said of George. But she said he caused her to believe that “I couldn’t fight it,” that the “death penalty will eventually be taken off the table,” and that “all [death-penalty] cases are going to be life sentences" in Pennsylvania. On Wednesday, Common Pleas Court Judge M. Teresa Sarmina resentenced Kennedy to life in prison without parole and ordered that he be removed from death row after the District Attorney’s Office said it would no longer pursue the death penalty in his case. "I am upset. It makes me mad he’s no longer on death row. It’s sickening,” Richardson said two days later. Kennedy, now 36, killed Michael Richardson, a father of five who managed a store at 12th Street and Girard Avenue in North Philadelphia, during a robbery on Jan. 19, 2003. Kennedy first shot Richardson in a leg, then dragged him through the store and into the office, leaving a bloody trail, according to then-Assistant District Attorney Tom Malone, who presented those details in his closing argument as one of two prosecutors at the 2004 trial. After forcing Richardson to open a safe containing about $2,200, Kennedy put a .44-caliber Magnum revolver to Richardson’s head and shot him execution-style as Richardson, 35, prayed and begged for his life. Jurors, who wept during the trial, convicted Kennedy, of North Philadelphia, of first-degree murder and sentenced him to death. Michael Richardson, in a family photo with two of his sons. Both George and a victim-services coordinator from the District Attorney’s Office told her that they didn’t want her to have to deal with more appeals from Kennedy, Richardson said. Told Monday of Kristi Richardson’s comments, Krasner’s spokesperson Ben Waxman replied by email that the decision to vacate the death sentence was Sarmina’s and resulted from a claim of ineffective counsel. “That is wrong,” Richardson said Monday. She said she was “blindsided” when the judge asked her in court Wednesday if she wanted to say anything because she hadn’t been prepared by George to do so. Krasner’s office has been accused of being less than transparent with victims or their families about the steps it could take on matters that significantly impact court decisions. Richardson said she had sent a letter to the district attorney’s victims-services unit last year after being told of Kennedy’s most recent appeal. In it, she expressed her desire for the judicial system to follow through with the jury’s decision on the death penalty. She said Friday that she did not know whether the judge received a copy of her letter. She recalled how she had met her future husband when he worked at a Woolworth store in Germantown and she worked at nearby Gaffney Fabrics. She asked him to her prom at the Philadelphia High School for Girls. Kristi Richardson and Michael Richardson at Kristi's 1989 Philadelphia High School for Girls prom. They married two years later, when she was 19 and he 23. Three accomplices to the fatal robbery — Jamaar Richardson, now 37, who had worked at the Rite Aid; James Richardson, now 38; and Lavar Brown, now 41 — were convicted of second-degree murder and received mandatory sentences of life in prison. The Richardson brothers are not related to the victim. Brown was arrested in December 2003 when he fatally shot a man he mistakenly thought could link him to the Rite Aid robbery, Malone said Monday. He was sentenced to death for that shooting. Krasner’s office last April filed a motion saying Brown should leave death row. The state Supreme Court, however, disagreed and Brown remains in death row. The Richardsons had celebrated their 12th wedding anniversary on Jan. 15, 2003, four days before Kennedy executed him. “We were talking about getting old together,” recalled Kristi Richardson, who has since moved from their Crescentville home.